I’m a PhD candidate studying the control of networked systems with Mehran Mesbahi. In 2014, I graduated from the University of British Columbia with a degree in physics and math. I joined Mehran’s group in fall of the same year. Outside of my research life, I enjoy playing tennis and drinking coffee. I’m currently working on an Arduino-based coffee roaster with a model-predictive temperature controller. I also build guitars, and worked at the Larivée guitar factory in Vancouver for a short time when I was in high school. Broadly speaking, my research is on the control and estimation of networked dynamical systems. Such systems appear everywhere in both nature and engineering, for example in swarms of robotic vehicles, social networks, gene networks, animal flocking and spacecraft formation flight. My focus is on networked systems that have an intrinsic state-dependent graph structure, meaning that the dynamical process on the network changes the communication links between agents in the network. Such processes are highly nonlinear and are difficult to analyze with standard techniques. Pretty much all real-world networked systems are state-dependent. The goal of my research is to find methods of analysis that allow one to formulate controllers and estimators for such state-dependent networked systems. In my previous life as an undergraduate student at the University of British Columbia, I worked at the Canadian Institute for Theoretical Astrophysics under the supervision of James Owen. We studied how X-ray heating contributes to the dispersal of protoplanetary discs. I also had the good fortune to work with Richard Marchand and Richard Sydora at the University of Alberta, where we worked on how to use electrodynamics space tethers for removing radiation belts around the Earth. In my final year, I did two Honours theses. 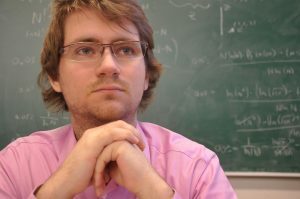 I worked with Greg Martin on the Hilbert-Pólya and pair-correlation conjectures, and with Joanna Karczmarek’s string theory group studying the geometry of membranes emerging from the Berenstein-Dzienkowski Hamiltonian. U. Lee, T. P. Reynolds, B. Barzgaran, M. Hudoba de Badyn, J. Chrisope, A. Adler, K. Kaycee, M. Mesbahi. Development of Attitude Determination and Control Subsystem for 3U CubeSat with Electric Propulsion. AIAA SPACE 2017. M. Hudoba de Badyn, M. Mesbahi. Growing Controllable Graphs via Whiskering and Submodular Optimization. (2016) In Proc. of the 55th IEEE Conference on Decision and Control. arXiv:1609.08733. M. Hudoba de Badyn, R. Marchand, R. D. Sydora. Using Orbital Tethers to Remediate Geomagnetic Radiation Belts. (2016) J. Geophys. Res-Space 121: 1114-1123. M. Hudoba de Badyn, A. Chapman, M. Mesbahi. Network Entropy: A System-Theoretic Perspective. (2015) In Proc. of the 54th IEEE Conference on Decision and Control, pp. 5512-5517. M. Hudoba de Badyn, J. L. Karczmarek, P. Sabella-Garnier, K. Huai-Che Yeh. Emergent geometry of membranes. (2015) JHEP 2015:89. M. Hudoba de Badyn, A. Tahir. Orbital Electromagnetic Field Generators as a Method for Removing Small and Untrackable Space Debris. AIAA SPACE 2015. J. E. Owen, M. Hudoba de Badyn, C. J. Clarke, L. Robins. Characterizing thermal sweeping: a rapid disc dispersal mechanism. (2013) MNRAS 436 (2): 1430-1438. M. Hudoba de Badyn. Algebraic graph theoretic methods in control theory. 2016 Joint Mathematics Meeting. (January 2016). M. Hudoba de Badyn, R. Marchand, R. Sydora. The use of orbital tethers to remediate geomagnetic radiation belts. 56th APS DPP Meeting. (October 2014). M. Hudoba de Badyn, J. E. Owen, C. J. Clarke, L. Robins. Characterizing thermal sweeping: a rapid disc dispersal mechanism. APS Pacific Northwest Meeting. (May 2014). M. Hudoba de Badyn. Two methods of determining the critical β of the 2-D Potts model. Canadian Undergraduate Mathematics Conference. (July 2013). J. E. Owen, M. Hudoba de Badyn, B. Ercolano, C. J. Clarke. Thermal sweeping: a rapid disc dispersal mechanism. Protostars and Planets VI. (July 2013).